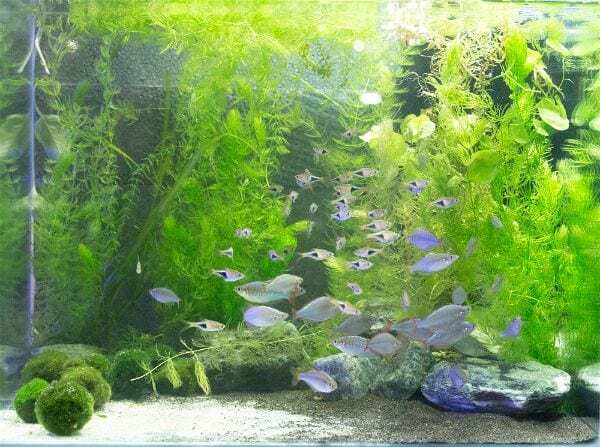 Planted freshwater aquariums are interesting and quite beautiful. There’s nothing like the look of tropical aquatic plants and fish swaying in the currents. 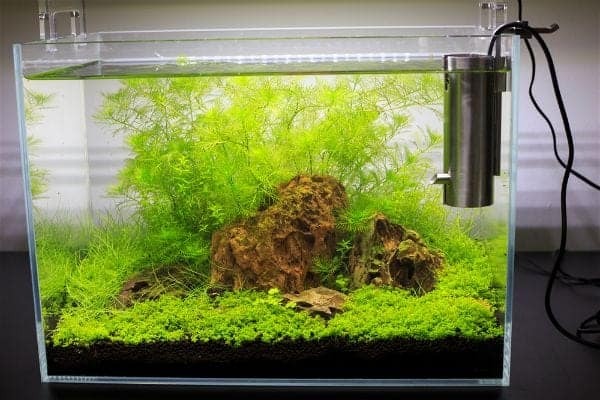 But many aquarists are discouraged when they first learn that planted aquariums need carbon dioxide injection, intense lighting and special water conditions. 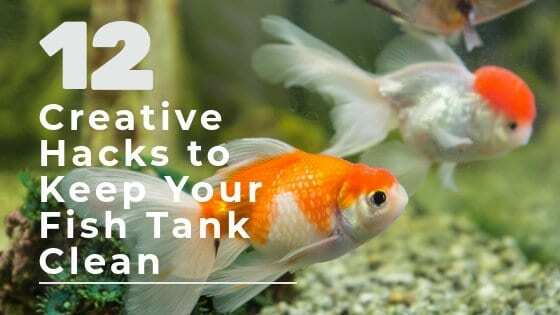 While it’s true that some tanks require high tech gear, you still can set up a planted aquarium by using low tech methods and compatible aquatic plants. What to know how to do it? 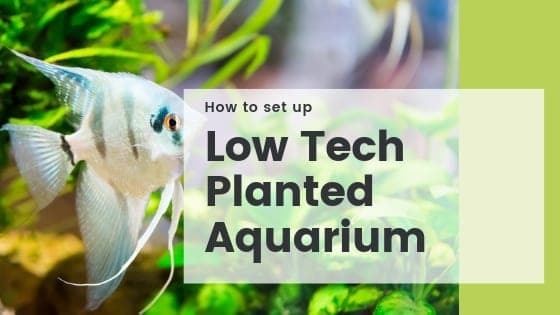 Follow along as I describe the easy steps to having a low tech planted aquarium of your own. You may have been impressed and overwhelmed by a “gigantic” natural aquarium. But you don’t need a big tank to keep aquatic plants. If you’re starting fresh, you can choose any of the modern rimless glass tanks in the under ten gallon range. If you’ve already got an aquarium, that will work fine too. As with setting up any aquarium, use a solid aquarium stand, counter top or table that can hold the weight. Keep the aquarium away from heating and air conditioning ducts. With the low tech approach, it’s OK for the aquarium to get a little extra sun from a window or door. You just don’t want the aquarium to over heat from being in direct sunlight for hours and hours. The natural light, even if reflected off interior walls, will help with plant growth. It’s no mystery that plants need light. It’s the same with aquatic plants. Some aquatic plants need a lot of light to thrive. That’s normally when you’ll see deeper aquariums using bright lighting systems. The bright light also makes the plants hungry for carbon dioxide, which has to be pumped into the water. We’ll talk about CO2 later. For a low tech planted tank, we’ll be selecting plants that don’t need really bright light. They are more hardy and easier to care for too. Whether you are starting a new aquarium or using an existing aquarium, you need to provide the right type of light for the plants. By right lighting I mean the light quality plants require for photosynthesis. The pigments in the plant tissue respond to certain types of lighting better than others. To make things simple, choose “full spectrum” fluorescent tubes or an LED fixture that appears white. Not all lighting is compatible with live plants. Don’t use lighting designed to artificially enhance fish colors and Day Glo gravel. Plants need “full spectrum” lighting for photosynthesis. It also creates a nicely illuminated tank that looks natural. If you do choose to use a LED lighting fixture, be careful that you don’t select a reef specific light. Reef lighting tends to be heavy in the blue spectrum, which benefits corals. Make sure the light is designed for freshwater or can be fine tuned to recreate natural daylight conditions. When growing aquatic plants, the gravel or “substrate” does more than anchor the plants. Most aquatic plants have a fibrous root system that adsorbs nutrients from the soil. In nature, the roots adsorb essential nutrients like phosphate, nitrate, and sulfate from the soil particles and water surrounding the root hairs. The roots also release chemicals that make essential trace elements like iron and zinc easier take in. While some plant enthusiasts use specialty soils, we’re taking the low tech approach. This doesn’t mean just any gravel will work. Regular aquarium gravel is often too large. Plants roots like to be surrounded by the substrate. It makes a better root zone that keeps nutrients and keeps the roots in contact with nutrients held within the substrate. You may have to swap out your old gravel if it doesn’t look natural or is the large pebble type. A fine grain gravel will work OK or you can use one of the specialty aquatic plant substrates designed for planted aquariums. The particle size is usually in the 1 to4 mm range, which looks natural and holds the plants securely. We’re trying to go low tech, but if you have to change the gravel or start from scratch, why not go with a better substrate if you can? Aquatic plants like water movement. Flowing water brings a steady stream of nutrients and carbon dioxide to the leaves. The idea is to circulate water without agitating the surface of the water. Too much agitation drives off carbon dioxide, which plants need to thrive. It’s not necessary or desirable to blast the plants with strong currents either. All that is needed is a gentle flow throughout the aquarium. With smaller tanks a hang on power filter will keep the water clean while providing water movement. Planted aquariums don’t get as dirty as regular fish aquariums. That’s because the tank is intended primarily to support plant growth, not be packed with tropical fish. A properly stocked planted aquarium will require very little traditional cleaning and gravel siphoning. Activated carbon will remove water discoloration and allow better light penetration for the plants. 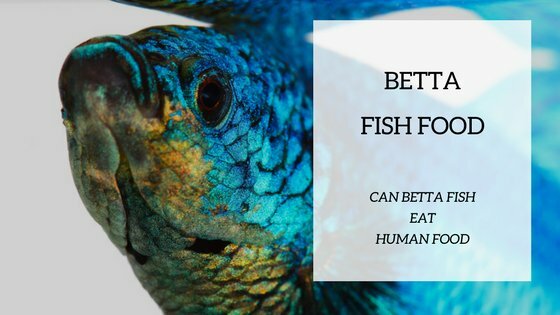 Tropical plants and fish do best when the water temperature remains in a specific range. 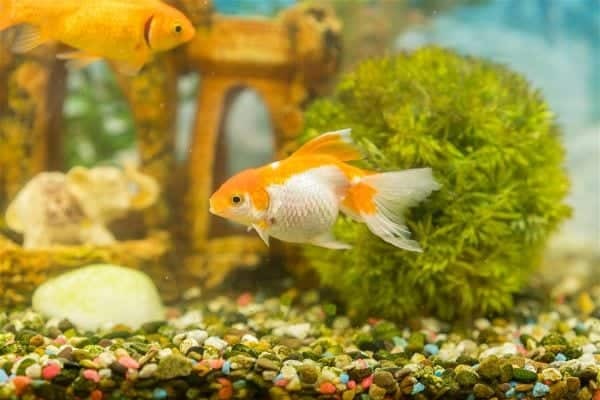 A submersible aquarium heater will stabilize the temperature, so you won’t have to worry about seasonal changes or HVAC influences on the tank. Tropical freshwater aquariums are usually kept at 75-80°F. Set the heater’s thermostat to this range. It’s advisable to use a separate thermometer to dial in the heater’s setting. Water quality is important when keeping aquatic plants. Most plants don’t like water with a high level of minerals. Some species are very sensitive to water quality, but for the low-tech planted tank, we’ll choose hardy plants that thrive in a wide range of water types. If you’re water supply has a high general hardness and alkalinity (KH), you may want to dilute it with reverse osmosis (RO) water. The automatic water machines designed to refill water jugs use reverse osmosis to remove minerals and salts. Blending some RO water into your tap water will bring the hardness down to lower levels, if this is preventing your plants from thriving. RO water is perfect for topping off an aquarium too, since it does not add more minerals back to the tank. There’s lawn fertilizer, flower fertilizer and vegetable fertilizer. But did you know there is also aquatic plant fertilizer? Aquatic plants need nutrients just like other plants. 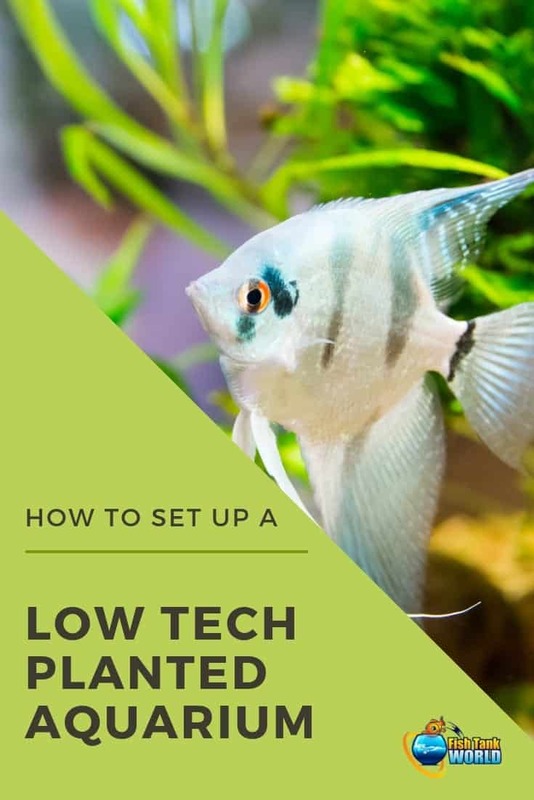 In the low tech planted aquarium fish waste will provide some of the essential nutrients, like phosphate and nitrate, but the plants will need trace elements to stay lush and colorful. Certain essential elements, like iron, molybdenum and zinc, are important nutrients plants must have to stay alive. Look for a liquid or tablet fertilizer that lists trace elements in the ingredients. They’ll keep your plants colorful and growing. Start off by using a ½ dose of fertilizer. If the plants are growing and looking good, stay with the lower dose. Over dosing will not stimulate plant growth. It will only cause algae to grow. We want to select only the hardiest, easiest to grow aquatic plants for the low tech tank. The idea is to have the plants grow and look beautiful while out competing nuisance algae. The good news is there are plenty of tough plants that look great and don’t need a lot of care. Here is a list of readily available plants to use in your low tech planted aquarium. you can find more suggestions here. Water Sprite (Ceratopteris thalictroides)-A great middle of the tank plant. It can also float at the water surface. A fast grower! Anubias nana – a hardy plant with beautiful dark green leaves in low, handsome clumps. Ideal for tying onto a piece of driftwood for an exotic look. Dwarf Sagittaria (Sagittaria subulata)- fast growing plant that looks with grass-green thin leaves. It will form dense clusters. Cryptocoryne (Cryptocoryne wendtii)-Low-growing plant with green, olive green, and reddish- brown leaves. Crypts like fertilizer tablets placed in the substrate, near their roots. Micro Sword (Lilaeopsis novae-zelandiae)- beautiful, delicate-looking plant with light green grass-like leaves, it will spread out in thick carpet of grass. Moss Ball (Chladophora aegagropila)- a green, velvet-like algae ball native to Japan and Northern Europe. The plant will roll around the tank from water currents. Christmas moss (Vesicularia montagnei)- looks like evergreens or Christmas tree branches. This moss will attach to solid surfaces like drift wood, rocks and caves. Tropical fish are last on the list for our low tech aquarium. That’s because the first priority is the plants. Get the plants thriving and the fish will be happy too! The aquatic plants will act as a natural filter, oxygen source and algae inhibitor. 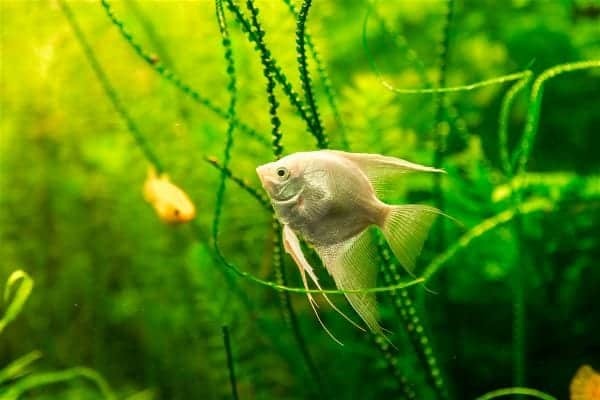 The fish will color up and look beautiful as they swim through the lush tropical paradise. There are too many compatible fish to list. 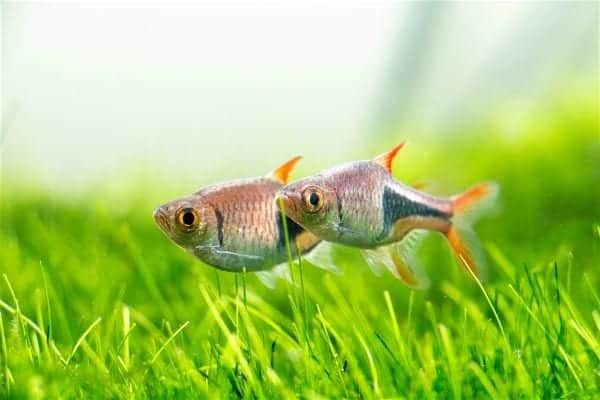 Just stick with plant friendly species like cardinal tetras, barbs, cory cats, guppies and even dwarf cichlids. 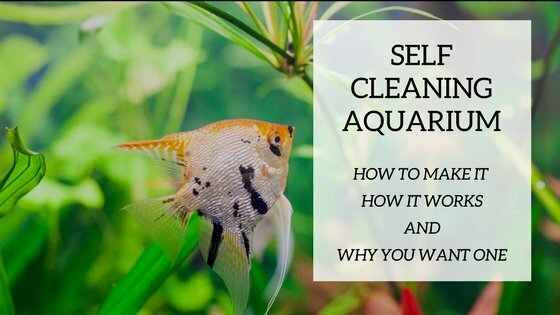 Don’t over stock the aquarium as it will just cause algae to take over. The low tech planted tank will be low maintenance and trouble free with a low fish load and limited feeding with flake and frozen fish foods. Not everyone wants to dive into “water gardening” in a big way. Fortunately, it’s not necessary to set up a complicated aquarium to enjoy the beauty of aquatic plants. The low tech method works on any size aquarium and makes it simple to keep live plants and colorful tropical fish anywhere in your home or office!